Conveniently located, Treebo Trip Namaste Indore offers a good value for accommodation. 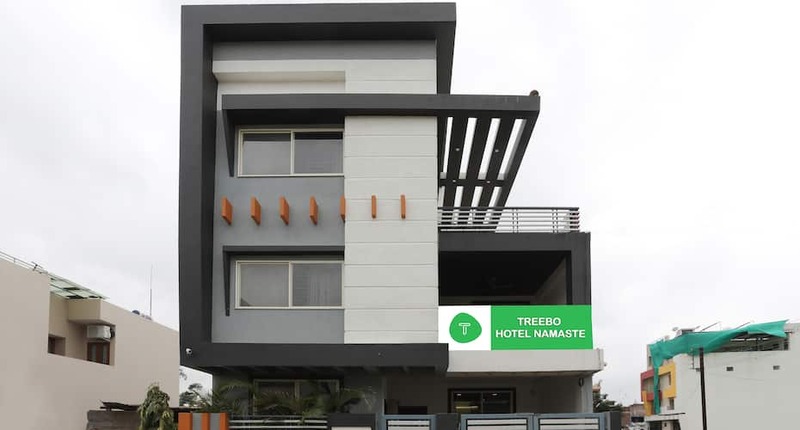 Located close to Full Gospal Chruch Of God, Treebo Trip Namaste Indore offers complimentary breakfast service and Wi-Fi access to its patrons. This 3-storey property has 7 well-maintained rooms. Wardrobe, telephone, air-conditioned, television, desk, tea coffee maker and attached bathroom with hot and cold running water facility are few of the amenities in the rooms. Front desk and parking facility are a few of the facilities offered at Treebo Trip Namaste Indore. This hotel in Indore offers laundry and security service for the convenience of the guests. Treebo Trip Namaste Indore is close to the travel hubs like Devi Ahilyabai Holkar International Airport (13 km) and Indore Junction Railway Station (6 km). Places worth visiting are Kamla Nehru Prani Sangrahalaya (8 km) and Rani Sati Dwar (5 km). What people love the most about this property is its great location and hospitality. Book now and enjoy world class services at Treebo Trip Namaste Indore. What needs to improve : Goigle map do not address the hotel. Super clean rooms. Staff at reception is very polite and helpful especially Mr. Santosh at reception is fast, quick and efficient. Other staff Mr. Rakesh is also professional. Surrondings of the hotel is super quite and very peaceful. Good for relaxation. I stayed at this property for three days,as per Treebo policy every day they have to give 1ltr of mineral water bottle but simply they are giving ordinary water and breakfast also very poor and very less quantity (day 1 single aloo paratha,day 2 small cup of Poha,day 3 small poori with watery curry),there is no wi-fi facilities at the room at 1st floor and 2nd floor. House keeping also very poor. Nice stay, can be dine better. Hotel stay was good. Owner was friendly and rooms were clean and fresh. Staff was fine as it was a new one. The staff just needs more training in entertaining the guests as they work a lil bit slow. Overall stay was good.